Not to be confused with Massachusetts (Arlo Guthrie song). "And the Sun Will Shine"
"With the Sun In My Eyes"
"The Earnest of Being George"
"(The Lights Went Out In) Massachusetts" is a song by the Bee Gees, released in 1967. Written by Barry, Robin & Maurice Gibb. Robin Gibb sang lead vocals on this song and it would become one of his staple songs to perform during both Bee Gees concerts and his solo appearances. It later appeared on their 1968 album, Horizontal. The song became the first of the group's five No. 1 hits in the UK, reached No. 1 in twelve other countries, peaked at No. 11 on the Billboard Hot 100 and eventually became one of the best-selling singles of all time, selling over five million copies worldwide. When the brothers wrote the song, they had never been to Massachusetts. In a UK television special on ITV in December 2011, it was voted third (behind "How Deep Is Your Love" and "You Win Again") in "The Nation's Favourite Bee Gees Song". There are two different memories, Robin remembers us doing it in a boat going around New York City. And I remember us checking in at the St. Regis with Robert, going to the suite, and while the bags were being brought in we were so high on being in New York, that's how 'Massachusetts' began. I think we were strumming basically the whole thing, and then I think we went on a boat round New York. I don't know if we finished it, but I think that's where the memories collide. Everybody wrote it. All three of us were there when the song was born. We have never been there but we loved the word and there is always something magic about American place names. It only works with British names if you do it as a folk song. Roger Whittaker did that with Durham Town." [Robin Gibb also recalled to The Mail on Sunday on 1 November 2009]: "This was a bittersweet victory. The day it went to number one it was Bonfire Night and I was in the Hither Green rail crash in Lewisham. Forty-nine people died and it was one of Britain's worst rail disasters. Luckily I didn't get injured. I remember sitting at the side of the carriage, watching the rain pour down, fireworks go off and blue lights of the ambulances whirring. It was like something out of a Spielberg film. I thought, at least there is one consolation, we have our first UK number one." "Massachusetts" was recorded on August 9, 1967 along with "Sir Geoffrey Saved the World" at the IBC Studios in London and finished on August 17. Barry feels Bill Shepherd's orchestral score is perhaps the arranger's finest: "We never expected him to do that. Sometimes we would sing what we would [imagine] the strings doing. But in this case he did that himself, and I thought it was great. 'Massachusetts' was our first #1 in England". Before the release of this song, Australians Colin Petersen and Vince Melouney were facing deportation, and it appeared that they might have to leave the band as a result. On 12 August, British fans staged a protest on behalf of the musicians at the cottage of Prime Minister Harold Wilson. Three days later Bee Gees fan Deirdre Meehan chained and handcuffed herself to Buckingham Palace to protest the possible deportation. Ultimately, the musicians were allowed to stay. When it was released in the UK, the title was "Massachusetts (The Lights Went Out in)" but the subtitle was later dropped. In America, Atco Records delayed it to release "Holiday". The song "Massachusetts" has a minor claim to fame in the history of British radio as it was the second record played on BBC Radio 1. The first song to be played was "Flowers in the Rain" by The Move. It was the first No. 1 hit single by a non-Japanese artist on Japan's official hit chart, Oricon Singles Chart, on April 1, 1968. Former Yugoslav band Siluete covered the song in 1967. Claude François covered the song in 1967 as "La plus belle chose du monde". Czech singer Václav Neckář covered the song in 1968. Kenny O'Dell covered the song in 1968 on his album "Beautiful People"
Ed Ames recorded a version of this song on his album Who Will Answer? in 1968. Also in 1968, Hong Kong female singer Betty Chung covered this song in Mandarin Chinese with Chinese lyrics written by Wei Yin (魏因) and given the title name of <<我祝福他>>, appearing on her LP album Wild Flame (<<野火>>) and released by EMI Pathe Records. Estonian singer Jaak Joala covered the song in Estonian language. Between 1972 and 1974, this song was covered by Singapore-based female singer Ervinna, backing music by the Charlie & His Boys, on her LP album Golden Hits of 20th Century Vol. 6 with White Cloud Record of Singapore. The Seekers recorded this song following the death of Maurice Gibb. ^ Dale, Jon (24 June 2015). "Robin Gibb – Saved By The Bell – The Collected Works Of Robin Gibb 1968-1970". Uncut. Retrieved 7 May 2016. ^ a b c d Rice, Jo (1982). The Guinness Book of 500 Number One Hits (1st ed.). Enfield, Middlesex: Guinness Superlatives Ltd. p. 112. ISBN 0-85112-250-7. ^ a b "Show 49 - The British are Coming! The British are Coming! : With an emphasis on Donovan, the Bee Gees and the Who". Digital.library.unt.edu. Retrieved 6 April 2014. ^ Billboard Vol. 85, No. 34. Nielsen Business Media. 25 August 1973. p. 18. Retrieved 21 March 2012. ^ Hughes, Andrew. The Bee Gees: Tales of the Brothers Gibb. Retrieved 20 January 2015. ^ a b c Sandoval, Andrew. "Bee Gees - Horizontal". Album Liner Notes. Retrieved 24 May 2013. 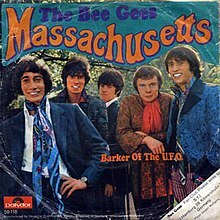 ^ a b "Massachusetts by Bee Gees Songfacts". Songfacts.com. 1 November 2009. Retrieved 6 April 2014. ^ Brennan, Joseph. "Gibb Songs: 1967". Retrieved 20 January 2015. ^ Brennan, Joseph. "Gibb Songs: 1967". Retrieved 24 May 2013. ^ a b c d e f g "Songs Written by the Gibb Family on the International Charts" (PDF). brothersgibb.org. Retrieved 20 January 2015. ^ a b "Bee Gees - Massachusetts". austriancharts.at. Retrieved 19 January 2015. ^ a b "Bee Gees - Massachusetts". ultratop.be. Retrieved 20 January 2015. ^ "Bee Gees - Massachusetts". officialcharts.de. Retrieved 19 January 2015. ^ a b "Bee Gees - Massachusetts". Dutch Charts. Retrieved 19 January 2015. ^ a b "Bee Gees - Massachusetts". norwegiancharts.com. Retrieved 20 January 2015. ^ "Kvällstoppen 1966-1969" (PDF) (in Swedish). Hits Aller Tijden. Retrieved 28 December 2012. ^ a b "Bee Gees - Massachusetts". hitparade.ch. Retrieved 20 January 2015. ^ Roberts, David (2006). British Hit Singles & Albums (19th ed.). London: Guinness World Records Limited. pp. 211–2. ISBN 1-904994-10-5. ^ "Bee Gees - Chart history". Billboard. Retrieved 20 January 2015. ^ "Bee Gees - Massachusetts". lescharts.com. Retrieved 20 January 2015. ^ "18 Songs Originally Written For Other Artists". cbslocal.com. 5 November 2012. Retrieved 20 January 2015. "Sir Geoffrey Saved the World"
"All My Christmases Came At Once"
This page was last edited on 29 March 2019, at 08:42 (UTC).